There’s been a revival, in recent years, of making people the stars of drag racing, once again, and their hot rods the revved and revered co-stars. Certain personalities lend themselves to stardom better than others, and while Gardner Stone may not be a household name in drag racing, his personality is larger than life and has certainly earned him recognition in his time. At nearly 77 years old, he flies under the radar, running in the Factory Stock Showdown in the NHRA and Factory Super Cars with the NMCA. His love affair with motorsports has come full circle and is complete with a myriad of stories nearly too good to be true. For Stone, it all began on a farm. “When I was a kid I worked on my cousin’s farm, and I loved driving the old John Deere tractors. We had an old car we used to chase cows back to the barn with in those days. I had a little racer that when I was six-seven-eight years old I used to take kids for a ride on in the park. I always had something with wheels. Eventually they got motors on ’em and so on. That’s my life. From the word ‘go’ Stone has been on wheels, and it’s clear whatever he’s doing, he’s full throttle. Stone is probably best known for two things: his unique bartering style to car sales and his four jet engine, 12,000-horsepower, flame-throwing tractor named The General. Drag racing was an entirely different deal [in the ‘60s]. When I started there was a flagman out in the middle of the track. There wasn’t a Christmas tree, there wasn’t a burnout box, there wasn’t any of that stuff. It certainly has worked, and worked well, for Stone, supporting his family and his hobbies while also earning him a reality TV series, “Family Trade,” which aired on GSN in 2013. Stone has turned over the day-to-day operations of both the dealership and his heavy equipment sales and rentals to his two children. His son Todd runs G. Stone Motors and daughter Darcy handles G. Stone Commercial. Stone’s try-anything mentality fit in well with the National Tractor Pulling Association [NTPA], where he garnered a host of championships. Prior to Stone’s 30-year history in the sport, however, he thought the idea of tractor pulling almost laughable. “When I first heard about putting big motors on an old tractor and go pull something down a track, I thought that sounded awful stupid to me — until I made a mistake and went to a tractor pull. Instantaneously, I was hooked. I just had to be part of that. You see these huge, huge tires turning — back then — 50 or 60 miles per hour. My latest tractor I turn at 160 miles per hour. It’s just something that once you saw it, God I gotta’ be part of that. I was in between motorized sports at the time so that’s what I jumped at. I’m always willing to take a chance. I mean, I’ll take a chance on anything. If I could go out on the track and know I could make an easy run and finish third or put it on the edge and win the race, what do you think I’m going to do? I’m going to go for a win. “I started with a mini-modified, which is 1550 pounds, then progressed up to one with four jet turbine engines that puts out 12,000 horsepower, weighs 8,000 pounds and blows fire. It’s a nice rig, if I do say so myself. We’ve been the national champion five times. The tractor has worked very well. Stone has largely hung up his helmet for tractor pulling. He stays involved watching his grandson, who now competes in the sport, but Stone has enjoyed reintegrating himself into drag racing after his 40 year absence. “Drag racing was an entirely different deal [in the ‘60s]. When I started there was a flagman out in the middle of the track. There wasn’t a Christmas tree, there wasn’t a burnout box, there wasn’t any of that stuff. So the handicap, they just gave you different spots on the track. They didn’t have a staggered tree. I mean, it’s all changed. Everything is different. The Vermont native has raced with the NHRA Factory Stock Showdown and NMCA Factory Super Cars over the last five years. 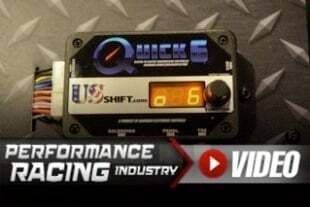 He currently focuses on NMCA, and with his longstanding ties to both GM and Ford, he sees the power of factory drag racing classes in promoting interest in the automotive industry as a whole. When you’re on the track, yeah, you can be bitter enemies, but when you’re back in the pits helping each other, working together, you’re friends — share a meal and share a drink. That’s my type of racing. As a lifelong proponent of the automotive industry, Stone hopes the class continues to create interest in cars for future generations. He’s been able to make a living and a pretty incredible life from various forms of horsepower, and a lot of that has simply come from him embracing both risk and opportunity. From taking a second mortgage out on his house to start a business from scratch, to taking a Victrola phonograph on trade, to putting four jet turbines on a tractor, there’s not much Stone hasn’t tried. “I’m always willing to take a chance. I mean, I’ll take a chance on anything. If I could go out on the track and know I could make an easy run and finish third or put it on the edge and win the race, what do you think I’m going to do? I’m going to go for a win. I’m not going to be safe. I’ve done this my whole life. You can’t be afraid to take a chance. Lisa began her love affair with drag racing at just four days old, later watching and crewing for her championship-winning father, Gary Bingham. Before switching to drag race journalism, Lisa spent six seasons behind the wheel of an 8.90 dragster.